Majorian (Latin: Flavius Iulius Valerius Maiorianus Augustus; ca. 420 – August 7, 461) was the Western Roman Emperor from 457 to 461. A prominent general of the Late Roman army, Majorian deposed Emperor Avitus in 457 and succeeded him. Majorian was one of the last emperors to make a concerted effort to restore the Western Roman Empire. Possessing little more than Italy, Dalmatia, and some territory in northern Gaul, Majorian campaigned rigorously for three years against the Empire's enemies. Majorian was the last of the Western Roman Emperors who was able to try to recover the Western Empire with its own forces. His successors until the fall of the Empire, in 476/480, were actually instruments in the hands of their barbarian generals, or emperors chosen and controlled by the Eastern Roman court. After defeating a Vandal attack on Italy, Majorian launched a campaign against the Visigothic Kingdom in southern Gaul. Defeating king Theodoric II at the Battle of Arelate, Majorian forced the Goths to abandon their possessions in Septimania and Hispania and return to federate status immediately. Majorian then attacked the Burgundian Kingdom, defeating them at the Siege of Lugdunum, expelling them from the Rhone valley and reducing them to federate status. In 460, Majorian left Gaul to consolidate his hold on Hispania. His generals launched a campaign against the Suebic Kingdom in northwest Hispania, defeating them at the battles of Lucus Augusti and Scallabis and reducing them to federate status as well. His fleet for his campaign to restore Africa to the empire from the Vandals was destroyed due to treachery. Majorian sought to reform the imperial administration in order to make it more efficient and just. The powerful general Ricimer deposed and killed Majorian, who had become unpopular with the senatorial aristocracy because of his reforms. According to historian Edward Gibbon, Majorian "presents the welcome discovery of a great and heroic character, such as sometimes arise, in a degenerate age, to vindicate the honour of the human species". The life of Majorian and his reign are better known than those of the other Western Emperors of the same period. The most important sources are the chronicles that cover the second half of the 5th century — those of Hydatius and Marcellinus Comes, as well as the fragments of Priscus and John of Antioch. Besides these sources, which are useful also for the biographies of the other emperors, some peculiar sources are available that make Majorian's life known in some detail, both before and after his rise to the throne. The Gallo-Roman aristocrat and poet Sidonius Apollinaris was an acquaintance of the Emperor and composed a panegyric that is the major source for Majorian's life up to 459. As regards his policy, twelve of his laws have been preserved: the so-called Novellae Maioriani were included in the Breviarium that was compiled for the Visigothic king Alaric II in 506, and help to understand the problems that pressed Majorian's government. Majorian was probably born after 420, as in 458 he is defined a iuvenis, a "young man". He belonged to the military aristocracy of the Roman Empire. His grandfather of the same name reached the rank of magister militum under Emperor Theodosius I and, as commander-in-chief of the Illyrian army, was present at his coronation at Sirmium in 379. The daughter of the magister militum then married an officer, probably called Donninus, who administered the finances of Aetius, the powerful magister militum of the West. The couple gave the name Maiorianus to their child in honour of his influential grandfather. Placidia was the younger daughter of Emperor Valentinian III, who planned to marry her to Majorian (450 ca.). As the powerful magister militum Aetius realised that this marriage would weaken his position, he sent Majorian away from his staff to private life, thus hindering the marriage. Around 450, the Western Roman Emperor Valentinian III considered the possibility of marrying his daughter Placidia to Majorian. Valentinian had two daughters and no sons, and therefore no heir to the throne. Having Majorian as son-in-law would have strengthened Valentinian in the face of other powerful generals and would have solved the problem of the succession. Furthermore, as Emperor, Majorian could have led the army himself, freed from the dangerous bond with a powerful general, such as Valentinian had been obliged to contract with Aetius. The intention of this plan was to avoid the possibility that barbarian generals like Huneric or Attila should succeed to Aetius, but clashed with the plans of Aetius himself. The Roman general, in fact, planned to marry his own son Gaudentius to Placidia. He therefore opposed Valentinian's plan, and put an end to Majorian's military career, expelling him from his staff and sending him to his country estate. According to the poet Sidonius Apollinaris, the cause of the fall of Majorian was the jealousy of Aetius' wife, who feared that Majorian could overshadow Aetius' prestige. It was only in 454 that Majorian was able to return to public life. In that year, Valentinian III killed Aetius with his own hands but, fearing that Aetius' troops might revolt, called Majorian back to office to quell them. In the following year, Valentinian III was killed by two former officers of Aetius' staff. There was then a fight for the succession, as no heir existed. 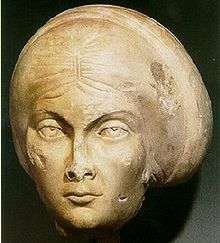 Majorian played the role of the candidate for the throne of Licinia Eudoxia, Valentinian's widow, and of Ricimer, who reserved for himself a role similar to Aetius'. In the end, the new Emperor was Petronius Maximus, a senator involved in Valentinian's murder, who outmanoeuvred the other candidates. To strengthen his position, he obliged Licinia to marry him and promoted Majorian to the rank of comes domesticorum (commander-in-chief of the imperial guard). Petronius ruled only for a few weeks, as he was killed during the Vandal sack of Rome (May 455). He was succeeded, not by Majorian, but by the Gallic-Roman noble Avitus, who had the support of the Visigoths. Both Majorian, comes domesticorum, and Ricimer, comes, initially supported Avitus, but when the Emperor lost the loyalty of the Italian aristocracy, the two generals revolted against him. First Majorian and Ricimer killed Remistus, the magister militum entrusted by Avitus with the defence of the capital, Ravenna. Then Ricimer defeated Avitus' troops near Placentia, taking the Emperor himself prisoner, and obliging him to abdicate. Finally, Majorian caused Avitus' death, possibly starving him, in early 457. Avitus was dead and the Western throne without a pretender. It was thus for the Eastern Roman Emperor to choose the successor, but Marcian could do nothing, as he died on January 27, 457. His successor on the Eastern throne was the general Leo I, who did not, however, select a colleague for the West, possibly because he intended to reign alone. On the other hand, Leo rewarded both Majorian and Ricimer: the former was appointed magister militum, the latter patricius and magister militum (February 28, 457). This victory was celebrated as Majorian's own, and the magister militum was acclaimed Emperor by the army on April 1, six miles outside Ravenna, at a place called ad Columellas, "at the Little Columns". There were actually two magistri militum to choose between, Majorian and Ricimer, but the barbarian origin of the latter barred him from the throne. Ricimer could, however, expect to exert a great influence on the new Western Emperor, because of their relationship dating back to the time of their service under Aetius and because of his control of the army as magister militum. Modern historians think that it was Leo I who initially refused to recognize Majorian as his colleague, although the general chosen by the army must have seemed the only viable candidate to the throne. The Eastern court was not displeased with the deposition of Avitus, an Emperor chosen by the Visigoths, whereas the only other candidate, Olybrius, had a politically difficult relationship with the Vandal king Genseric and no influence on the army. Despite this, the approval by the Eastern court of Majorian's election came late, as the new Emperor was actually crowned only on December 28. Leo I and Majorian jointly assumed the consulate for the year 458; it was customary that a new Emperor took this magistracy on the first year started as Emperor. The first problems Majorian had to handle were the consolidation of his rule over Italy and the recovery of Gaul, since this province had rebelled after the deposition of the Gallo-Roman emperor Avitus. The recovery of the lost provinces of Hispania and Africa was a project that Majorian had to leave for later. In summer 458, a group of Vandals, led by the brother-in-law of Genseric, landed in Campania, at the mouth of the Liri or the Garigliano river, and started devastating and sacking the region. Majorian personally led the Roman army to a victory over the invaders near Sinuessa and followed the defeated Vandals, loaded with their booty, as far as their own ships, killing many of them including their commander. After this event, Majorian understood that he had to take the initiative, if he wanted to defend the heart of his Empire, the only territory he actually controlled. So he decided to strengthen its defences. First, he issued a law, the Novella Maioriani 8 known as De reddito iure armorum ("On the Return of the Right to Bear Arms"), concerning the personal right to bear arms; in 440 Valentinian III had already promulgated a law with the same name, Novella Valentiniani 9, after another attack of the Vandals. It is probably to this time that another law is to be dated, the Novella Maioriani 12 known as De aurigis et seditiosis ("Concerning Charioteers and Seditious Persons"), to quell the disorders that sprang up during the chariot races. Both these laws are now lost. After consolidating his position in Italy, Majorian concentrated on the recovery of Gaul. When news of the deposition of the Gallo-Roman emperor Avitus arrived in Gaul, the province refused to recognize Majorian as his successor. An important clue to this is an inscription found in Lugdunum (modern Lyons) and dating to 458: according to Roman custom, the inscriptions were dated reporting the name of the consuls in office, who that year were Leo I and Majorian. This inscription, instead, records only the name of Eastern Emperor, showing that Majorian was not recognized as lawful Emperor. Another clue is the fact that, at the death of Avitus, the citizens of Lugdunum had allowed the Burgundians of king Gondioc to occupy the city, and that they sent an envoy to Leo, and not to Majorian, to ask for a reduction of taxation. Finally, there is a record of a failed usurpation in Gaul, around this time. In late 458, Majorian entered Gaul, with an army strengthened by barbarian units. The Emperor personally led the army, leaving Ricimer in Italy and choosing Aegidius and the magister militiae Nepotianus as collaborators. The imperial army defeated the Visigoths under king Theodoric II at the Battle of Arelate, forcing the Visigoths to abandon Septimania and withdraw west to Aquitania. The Roman victory was decisive: under the new treaty the Visigoths had to relinquish their vast conquests in Hispania and return to federate status. Majorian chose his trusted general Aegidius as the new magister militum per Gallias (military commander of Gaul) and sent an envoy in Hispania, to report the victory over the Visigoths and the new treaty with Theodoric II. With the help of his new foederati, Majorian entered the Rhone Valley, conquering its populations "some by arms and some by diplomacy". He defeated the Burgundians and besieged and conquered the city of Lugdunum: the rebel city was heavily fined, while the Bagaudae were forced to join the Empire. Despite the fact that the Gallo-Roman aristocracy had sided with Avitus, Majorian wanted a reconciliation, not a punishment. With the intercession of Majorian, magister epistolarum Petrus, Sidonius Apollinaris, the son-in-law of Avitus, was allowed to deliver a panegyric in honour of the Emperor (early January 459), receiving in reward the appointment to the rank of comes spectabilis. Much more effective was, however, the granting of the tax remission that the citizens of Lugdunum had requested from Leo I. The Roman Empire in 460 during the reign of Majorian. 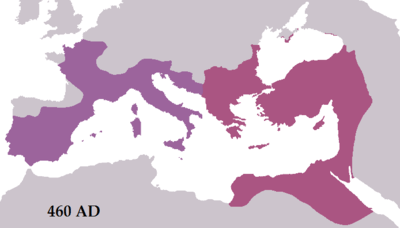 In the wake of the Vandal sack of Rome (455), the Visigoths had conquered Hispania, formally in the name of the new Western Emperor Avitus, actually controlling the territory themselves. Majorian planned to reconquer Hispania and use it as the base for the conquest of Africa. This rich province of the Western Empire, which provided for the very important grain supply to the city of Rome, was in fact under Vandal control. According to the historian Procopius, Majorian, "who surpassed in every virtue all who have ever been emperors of the Romans", wanted to know personally the military readiness of the Vandals and how the local populations would react to the Roman invasion. He dyed black his fair hair, for which he was famous, and went to Genseric claiming to be an envoy of the Western Emperor. Genseric tried to impress the enemy ambassador by showing him the arms collected in the warehouses and sent him back. This story is probably only a legend of Italian folklore, but it is a clue to the care with which the expedition was prepared. Majorian collected information on the enemy and gathered a fleet of three hundred ships to support the army in the reconquest of Hispania and in the invasion of Africa. It was probably during the preparation of this operation that Majorian sent the comes and patricius Occidentis Marcellinus to Sicily with an army of Huns, to take the island back from the Vandals. Marcellinus was the comes rei militaris (governor) of Illyricum, but he had become practically independent since the death of Aetius, not recognizing the imperial authority. Majorian convinced him to accept him as Emperor and even to collaborate with his troops in the military recovery of the Empire. The campaign started with an operation against the Suebi in North-Western Hispania, lasting the whole of 459, led by the magister militiae Nepotianus and the Gothic comes Sunieric. 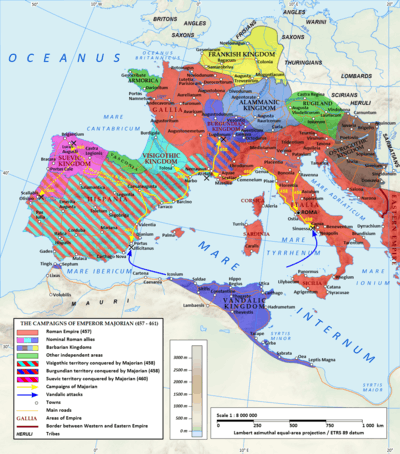 Majorian gathered the main part of the army in Liguria, then entered Aquitaine and Novempopulania coming from Theodoric's court in Toulouse (May 460). Genseric, fearing the Roman invasion, tried to negotiate a peace with Majorian, who rejected the proposal. The Vandal king then decided to devastate Mauretania, his own territory, because he thought that the Roman army would land there, and also ordered his navy to prepare incursions in the waters near the probable invasion area. While Majorian was campaigning in the province of Carthaginiensis the Vandals destroyed, through traitors, several ships that he was preparing for himself for a crossing against the Vandals from the shore of Carthaginiensis. Majorian, frustrated in this manner from his intention, returned to Italy. Majorian, deprived of the fleet that was necessary for the invasion, cancelled the attack on the Vandals. He received the ambassadors of Genseric, with whom he agreed to conclude peace, which probably included the recognition of the de facto occupation of Mauretania by the Vandals. On his way back to Italy, the Emperor stopped at Arelate. Majorian's domestic policy is known thanks to some of the laws he issued, the so-called Novellae Maioriani, that were included in a collection of Roman law entitled Breviarium, requested from some Gallo-Roman jurists in 506 by the 6th-century Visigothic king Alaric II . Novella Maioriani 12, De aurigis et seditiosis, "Charioteers and Seditious Persons", whose text is lost. Majorian understood that he could reign effectively only with the support of the senatorial aristocracy, whom he wanted to return to its pristine political prominence. At the same time, he planned to reduce the abuses perpetrated by the senators, many of whom cultivated their local interests disregarding the imperial policies, even refusing to pay taxes and keeping for themselves the taxes they had exacted. This fiscal evasion had a cascade effect that affected the small landowners, the citizens and the local civil magistrates. For example, the decurions had personally to compensate the imperial treasury for all taxes not exacted. Sometimes, oppressed by the debts accumulated in this way, the decurions abandoned their status, a problem already addressed by Emperor Julian (361–363). Majorian also cancelled tax arrears, knowing that fiscal policy could not be effective if taxpayers had to pay large accumulated arrears. On March 11, 458, Majorian issued a law entitled De indulgentiis reliquorum, "On the Remission of Past-Due Accounts" (Novella Maioriani 2). This law remitted all the tax arrears of the landowners. This same law explicitly prohibited public administrators, who had a record of keeping the collected money for themselves, from collecting taxes. This task was to be reserved to the governors alone. Another law issued to reorganise the tax system was issued on September 4 of the same year, and was entitled De bonis caducis sive proscriptorum, "On Abandoned Property and That of Proscribed Persons" (Novella Maioriani 5): the comes privatae largitionis Ennodius was to admonish the provincial judges against defrauding the imperial treasure, keeping for themselves a part of the money collected. The Emperor was also interested in repairing the backbone of the imperial administration. On 8 May 458, Majorian issued a law entitled De defensoribus civitatum, "The Defenders of the Municipalities" (Novella Maioriani 3), to re-establish the office of the defensor civitatis. This city magistrate represented the interests of the citizens in trials against the public administration, particularly in fiscal matters; this magistracy was still in existence, but actually ineffective, since it was often held by the same officials who cheated the population. Another law was issued on November 6 to strengthen the magistracy of the decurions. De curialibus et de agnatione vel distractione praediorum et de ceteris negotiis, "Decurions, Their Children and The Sale of Their Landed Estates" (Novella Maioriani 7), was issued to forgive past abuses perpetrated by the decurions. This forbade them to leave their status (going into hiding or marrying slave or tenant farmers) or to alienate their own properties. Majorian minted coins in gold, silver and bronze. Gold coinage was minted in great quantities. On these coins the Emperor is depicted, with few exceptions, with an combat helmet, a spear, a shield and a chi-rho, looking towards right; this typology was derived from a rare type minted in Ravenna for Honorius and used in great quantities only by Majorian, while it was dropped by his successors. The first series of solidi were minted probably in Ravenna, and bear at the obverse the joint portrait of Majorian and Leo I, thus celebrating the mutual recognition of the two Roman emperors. The mints of Ravenna and Milan issued both solidi and tremisses since the beginning of Majorian's reign. No series of semisses are attested for these two mints, probably because the semisses were typically minted by the mint of Rome and this mint was not active under Majorian, who never visited the ancient capital of his Empire during his four years of rule. The minting of solidi is attested for the mint of Arelate in 458, a fact compatible with the presence of Majorian in Gaul in that year. This mint was again active in 460, when the Emperor returned from his campaign in Hispania. The Visigoths minted some reproductions of his solidi, modelled after the issues of the Arelate mint: as Arelate issued only solidi, the Visigoths used those designs also for the tremissis. Silver coinage was issued almost exclusively by the Gallic mints; it has been suggested that these series were not issued by Majorian, but by Aegidius after the Emperor's death, to mark the fact that he did not recognize his successor, Libius Severus. Majorian also produced great quantities of nummi of great weight, mostly minted at Ravenna and Milan, and some contorniates, mostly in Rome, but probably also in Ravenna. The diffusion of Christianity in the Empire caused some social changes within the aristocratic families. In several wealthy families, daughters were obliged to take religious vows and never marry, so that the family wealth would not be dispersed in dowries. Majorian thought that this behaviour was harmful to the State, because it reduced the number of Roman children, and because it caused the girls to start illicit affairs. On October 26, 458, the Emperor addressed a law, the Novella Maioriani 6, to the Praetorian prefect of Italy, Caecina Decius Basilius. This law, titled De sanctimonialibus vel viduis et de successionibus earum ("Holy Maidens, Widows, and Their Succession"), imposed a minimum age of 40 for taking religious vows, considering that at this age the sexual drives of the initiated would be dormant. The law also granted women who had been forced to take religious vows, and were subsequently disinherited, the same rights on the legacy of parents as their brothers and sisters. In order to solve this same problem of the decline of the Roman population, in particular compared with the growth of the barbarians allocated within the imperial boundaries, Majorian addressed the problem of young women widowed and without children who never remarried because of the influence of the clergy, to whom they destined their goods in their will. The young widows were prohibited to take religious vows. By the same measure, departing in this from the policy of the Eastern Empire, Majorian insisted that a marriage without dowry and pre-wedding exchange of gifts (first from the bride's family to the groom, then in the opposite direction) was invalid; simultaneously ended the practice of requesting pre-wedding gifts of a value considerably higher than the dowry. Avitus, the predecessor of Majorian on the imperial throne, had alienated the support of the Roman senatorial aristocracy by appointing members of the Gallo-Roman aristocracy, of which he was a part, to the most important offices of the imperial administration. He was overthrown by Majorian, who did not repeat the error and rotated the main offices between representatives of the two aristocracies. When Majorian took power by deposing Avitus, the province of Gaul, where Avitus' power was based, did not recognize the new Emperor. When Majorian re-conquered the province, he chose to forgive this rebellion. The reason was that Majorian understood that one of the mistakes of his predecessor was to promote and trust only the senatorial aristocracy of Gaul, the region he come from, favouring it over the senatorial aristocracy of Italy. Majorian, instead, decided to gain the favour of the wealthy and noble families of the recovered province involving them in the administration of the power, together with the Italian aristocracy that, on the other side, had supported him since the beginning. A clue of this policy is the origin of the high civil servants of his administration, in particular of the consuls, whom the Emperor appointed jointly with his Eastern colleague. In the first year (458) Majorian reserved the honour for himself, as was usual for the augusti, while in the second year he appointed his former colleague and powerful magister militum, Ricimer. Then, for the year 460, he choose the Gallic senator Magnus, and for the next year the Italian senator Severinus. Magnus had been appointed Praetorian prefect of Gaul in 458, while the Praetorian prefect of Italy was Caecina Decius Basilius, who was the patron of the Gallic senator (and poet) Sidonius Apollinaris, while the comes privatae largitionis, Ennodius, was related to a family with interests in Arelate. Majorian also showed great respect towards the Roman senate, as suggested by the message he addressed to it on the eve of his coronation: he promised the senators he would not take into account the accusations of informers, which were much feared as they might be used by the Emperor to cause the fall of influential figures. And the promises were followed by facts, as told by Sidonius Apollinaris, who had been anonymously accused of the authorship of a pamphlet against some influential figures: during a dinner together, Majorian defused the risky situation with a witticism. Hence the occasion now arises that also each and every person who is constructing a private edifice through the favoritism of the judges who are situated in the City, does not hesitate to take presumptuously and to transfer the necessary materials from the public places, although those things which belong to the splendor of the cities ought to be preserved by civic affection, even under the necessity of repair. — Novella Maioriani 4, Clyde Pharr (ed. ), The Theodosian code: and Novels The Lawbook Exchange, Ltd., 2001 ISBN 1-58477-146-1, pp. 553–4. To cope with this phenomenon, Majorian promulgated a law Novella Maioriani 4, De aedificiis pubblicis ("Public Buildings"), promulgated in Ravenna on July 11, 459, and addressed to Aemilianus, praefectus urbi of Rome. The punishment for judges who had allowed the destruction of ancient public buildings was 50 pounds of gold, while their subordinates were whipped and had both hands amputated. Those who had removed materials from public buildings were to return it. The Senate had the power to decide whether there were extreme conditions that justified the demolition of an old building and, if it decided for the demolition, the Emperor had still the right to order that the resulting materials should be used to decorate other public buildings. Just as the fate of Avitus had been marked by the betrayal of Ricimer and of Majorian and by the dismissal of his German guard, so the fate of Majorian himself was decided by the disbandment of his army and a plot organized by Ricimer. In fact, while the Emperor was busy away from Italy, the barbarian patricius et magister militum had gathered around himself the aristocratic opposition to his former comrade with whom, just a few years earlier, he had cultivated dreams of power. Majorian's legislation had shown that he intended to intervene decisively on issues that plagued the empire, even if they countered the interests of influential aristocrats. After spending some time at Arelate, his base at the end of the operation against the Vandals in Hispania, Majorian disbanded his barbarian mercenaries and, accompanied by some guards, set off to Rome, where he intended to carry out reforms. Ricimer went to meet Majorian with a military detachment; the magister militum met the Emperor near Tortona (not far from Piacenza, where Avitus had been killed), and had him arrested and deposed (August 3). The Emperor was deprived of his dress and diadem, beaten and tortured. After five days, Majorian was beheaded near the river Iria (August 7, 461): He was about forty years old and had reigned for four years. The city of Tortona now hosts, in the church of St. Matthew, a building traditionally identified as the "mausoleum of Majorian". After the death of Majorian, Ricimer waited for three months before placing on the imperial throne a person he believed he could manipulate. He finally chose Libius Severus, a senator of no political distinction, probably selected to please the Italian senatorial aristocracy. The new emperor was not recognized by the Eastern Emperor Leo I, nor by any of the generals who had served under Majorian; not by Aegidius in Gaul, not by Marcellinus in Sicily and Illyria, and not by Nepotianus in Hispania. ↑ The History of the Decline and Fall of the Roman Empire, Chapter XXXVI "Total Extinction Of The Western Empire"
1 2 3 4 5 6 7 8 9 10 11 12 13 14 15 16 17 18 19 Mathisen. ↑ This identification, based on a passage in the work of Priscus, is not universally accepted by the historians. See MacGeorge, p. 189, for a summary of the arguments in favour of the identification, and Arnold Hugh Martin Jones, John Robert Martindale, John Morris, "Domninus 3", Prosopography of the Later Roman Empire, Volume 2, Cambridge University Press, 1992, ISBN 0-521-20159-4, p. 373, for the arguments against it. ↑ Sidonius Apollinaris, Carmina, V.198–200. ↑ Sidonius Apollinaris, Carmina, V.266–268. ↑ The exact location of Vicus Helena is unknown, but it was in Northern France, probably near modern Arras (Jan Willem Drijvers, Helena Augusta, BRILL, ISBN 90-04-09435-0, p. 12). ↑ Sidonius Apollinaris, Carmina, V.207–227. 1 2 O'Flynn, pp. 94–95. ↑ Sidonius Apollinaris, Carmina, V.290–300. ↑ Sidonius Apollinaris, Carmina, V.305–308. ↑ Sidonius Apollinaris, Carmina, V.312–314; John of Antioch, fragment 201.6. ↑ It is however possible that Majorian was appointed comes domesticorum by Valentinian when he was recalled back in service after Aetius' murder (Mathisen). ↑ After the death of Libius Severus in 465, Leo waited two years to select a new colleague, Anthemius. 1 2 Fasti vindobonenses priores, 583. ↑ Sidonius Apollinaris, Carmina, V.373–385. ↑ Sidonius Apollinaris, Carmina, V.9–12. ↑ Auctarium Prosperi Hauniensis, s.a. 458. ↑ Sidonius Apollinaris, Carmina, V.441–442. ↑ CIL XIII, 2363, to be compared to CIL XIII, 2359. ↑ Gregory of Tours, Glory of the Confessors 62. Cited in Mathisen. ↑ Sidonius Apollinaris tells (Letters, I.11.6) that this usurpation regarded some Marcellus. The hypothesis that this Marcellus is to be identified with the semi-independent comes of Illyricum Marcellinus has been rejected, as this conspiracy was to put Avitus back on the throne, or to oppose a Gallo-Roman noble to Majorian. 1 2 Priscus, fragment 27. ↑ Sidonius Apollinaris' Carmen V.
↑ Sidonius Apollinaris, Carmina, V.574–585. 1 2 Arnold Hugh Martin Jones, The Later Roman Empire, 284–602, JHU Press, 1986, ISBN 0-8018-3353-1, p. 241. MacGeorge, however, maintains that Marcellinus' return under the Western Emperor's rule is not attested, and thinks that Marcellinus was in Sicily either to take part independently in the campaign against the Vandals or, by order of the Eastern Emperor, to put pressure on Geiseric for the restitution of Empress Eudoxia and her daughters (pp. 46–48). ↑ Roger Collins, Visigothic Spain, 409–711, Blackwell Publishing, 2004, ISBN 0-631-18185-7, p. 32. ↑ Chronica gallica anno 511, 634; Marius Aventicensis, s.a. 460; Hydatius, 200, s.a. 460. 1 2 3 Chronica gallica anno 511. 1 2 3 4 This Ennodius was a relative of the poet and bishop Magnus Felix Ennodius (474–521). ↑ Novella Maioriani 7.14, November 6, 458, cited in Mathisen. 1 2 3 Vagi, David, Coinage and history of the Roman Empire, c. 82 B.C.--A.D. 480, Taylor & Francis, ISBN 1-57958-316-4, p. 567. 1 2 Novella Maioriani 6.1–3, cited in Grubbs, p. 110. 1 2 Novella Maioriani 6.5–8, cited in Grubbs, pp. 232–234. ↑ Novella Maioriani 6.9–103, cited in Grubbs, p. 119. ↑ Novella Maioriani 1, De ortu imperii domini Majoriani Augusti, "The Beginning of the Reign of Our Lord Majorian Augustus". ↑ This event took place in 461, and is recorded in a letter (Letters, I.11.2–15) of Apollinaris to a friend (Mathisen). ↑ Paolo Delogu, Le invasioni barbariche nel meridione dell'impero: Visigoti, Vandali, Ostrogoti, Rubettino, p. 336. ↑ John of Antioch, fragment 203; Marcellinus, sa 461; Fasti vindobonenses priores, No 588. Procopius (VII.14–15) does not mention the Emperor's return from Hispania and said that Majorian died of dysentery: it is possible that the news has been put about by Ricimer (Fik Meijer, Emperors Do not Die in Bed, Routledge, 2004, ISBN 0-415-31201-9, p. 155). Victor of Tonnena erroneously claims that Majorian reached Rome and was killed there, and puts this event in 463 (Chronica, s.a. 463). ↑ "Mausoleo di Maiorano (Sec. I a.C.)", Città di Tortona.